Yesterday was a bizarre day. I wondered if something was going on down the beach in the early evening before sunset. A young bloke was surfing doing acrobatics when he landed on a young bull shark. The shark did not enjoy the impact of the board on his back and bit the unsuspecting young surfer. The surfer was able to swim to shore and get help when he arrived. He could have easily lost his leg when being shaken around by the shark. The shark fortunately swam off after the incident. This was the only shark attack on Mermaid Beach that I have heard of. Am i afraid. I'm much more afraid of the agro drivers who go way too fast on Hedges, especially for my son's safety! I went swimming wearing my goggles. We noticed a helicopter hovering over the surf this morning for a few minutes, perhaps hovering over where there might be an errant shark! A surfer is reportedly in a stable condition after being bitten by a shark on the Gold Coast. The man emerged from the surf at Nobby Beach about 5pm (AEST) on Tuesday with a gash to his leg, the Department of Community Safety says. 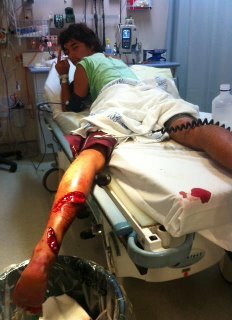 The Nine Network reports the victim, 20-year-old student Billy O'Leary, was bitten by a bull shark on his daily surf. He saw the shark swim away, returned to shore and called for help, it was reported. 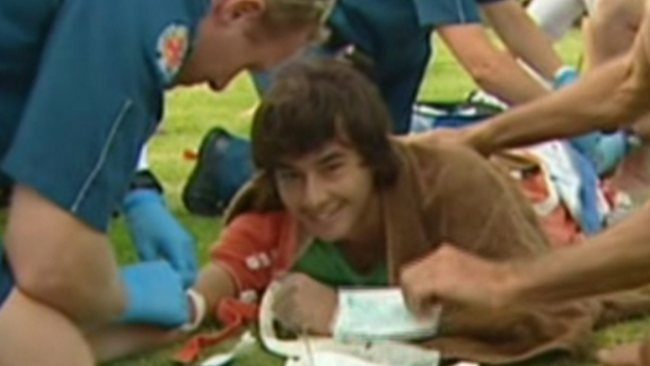 The man was stable and conscious, even giving a thumbs up to television cameras as ambulance officers treated the wound. He has been taken to Gold Coast Hospital. A surfer has been taken to hospital after being bitten by a shark on Queensland's Gold Coast. The 20-year-old man suffered wounds to his lower leg in the incident that happened at Nobby Beach about 5pm Tuesday (AEST). 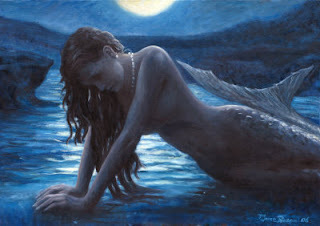 It is believed he may have landed on a small bull shark while doing an aerial manoeuvre. Chief lifeguard Warren Young says the man has deep gashes on his left calf that will require stitches. "He feels like he perhaps landed on it - he's come off his board and landed on it doing an aerial," Mr Young said. "That's what he's said to us, so maybe he's landed on it and it's reacted. "I guess your skin's really soft in the water and sharks have pretty sharp teeth." Mr Young says such attacks are uncommon. "When you look at the number of people who surf in this area day in, day out, and the many thousands of surfers, it's still a fairly small fraction of time these things happen," he said. "Being a small shark and the water's a bit discoloured, you're not going to see it ... we think it was perhaps a bull shark." Mr Young says a number of factors were in the man's favour. "I guess it is lucky that the lifeguard stabilised it straight away ... he wasn't panicking and he at first thought he'd landed on his board, cut himself on his board then he realised he had been attacked," he said. Friend Tyson Kolkka says they were both paddling for the same wave before it happened. "He was on the inside and then he went it and I watched him just race down the line and didn't look any further into it," he said. "I was waiting for him to paddle back out or walk up the beach and I couldn't see him. "Then all of a sudden there was my other mate was waving us in and I looked down and Billy was crawling up the beach and I didn't know what happened." Another friend, Shane Cable, was sitting on the beach and watched the incident unfold. "I ran down and he had two massive gashes," he said. "The lifeguard had just put everything away and he was just walking up to get in the car and leave. "Luckily they were still there for five more minutes and they came down and chucked some bandages on it." Fellow surfer Tim Windisch says his friend was lucky. "He was trying to yell out for help at the beach but no-one knew what was going on," he said. "I was still out there surfing, they were trying to wave us in, but I didn't know what was going on.